Confiscated Japanese-Canadian boats in Alert Bay during World War II. 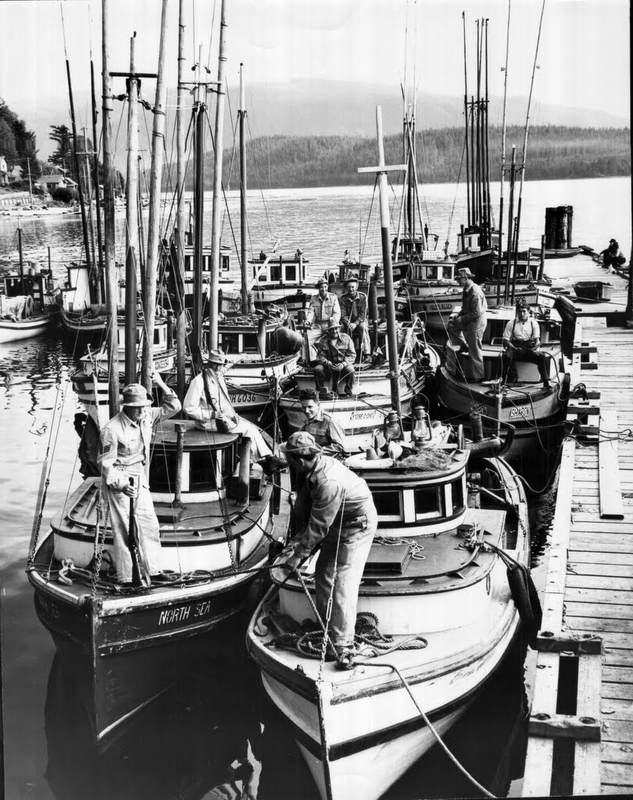 The North Island Eagle newspaper's photo of the week depicts confiscated Japanese gillnet boats at the dock in Alert Bay during World War II. Japanese settlers played a significant role in the settlement of the North Island in the early 1900s. Many Asian immigrants found that there was less racism in BC's small coastal communities, and they found success in the logging, fishing, farming, and whaling industries and as the owners of small businesses. Strong friendships formed in many cases with local First Nations communities. Historic North Island communities have graveyards with Japanese grave sites dating to this period. Following the Japan's attack on Pearl Harbour in December 7, 1941, those of Japanese heritage were rounded up and interned in camps in the BC interior. 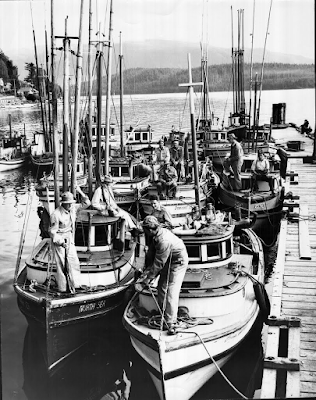 Their possessions were confiscated, and many, like these fishing boats, became property of the Canadian government and were used by the military for the remainder of World War II. Japanese residents never returned to the North Island in the numbers seen prior to the war. Kathy at the new North Island Eagle newspaper has asked me to provide a weekly historical photo with a bit of a blurb. 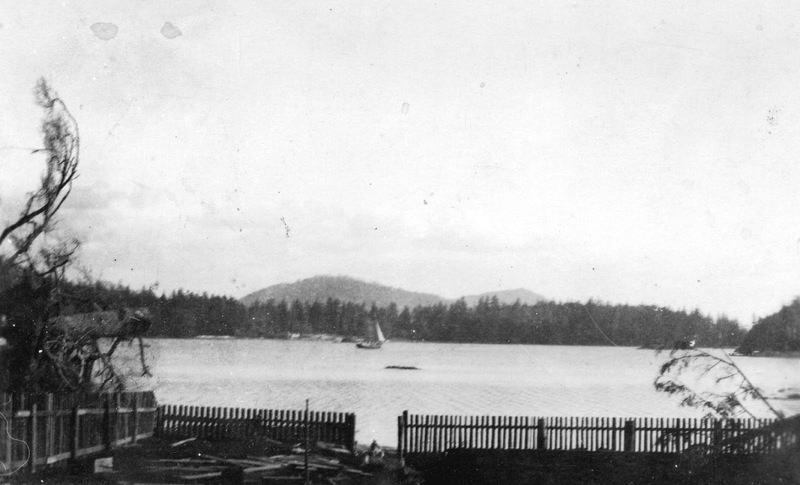 Week 1 features a photo of Sea Otter Cove taken in 1914. Sea Otter Cove is just to the north of San Josef Bay in the Cape Scott area. The photo was taken from the homestead of Captain Henry Peterson by Major James Skitt Matthews. During the early 1900s there were numerous pre-emptions on the North Island, many concentrated in the Cape Scott area and on the trail between San Josef and Holberg. Sea Otter Cove was not a popular anchorage due to a number of large rocks which impeded ships from entering the harbour. Captain Peterson piloted a number of ships in the area which supported the North Island settlers, and was the father of Les Peterson, author of "A Cape Scott Story." When he died he was buried in the small community of San Josef. Sea Otter Cove was not named for the marine mammals currently making a comeback in the area, but was named by Captain James Hanna after his ship the Sea Otter, when he was exploring the area in 1786.